John W. Patty is a Professor of Political Science and Quantitative Theory & Methods at Emory University. He is currently co-editor of the Journal of Theoretical Politics and the Political Economy of Institutions and Decisions book series at Cambridge University Press. Professor Patty’s research focuses on mathematical models of political institutions. His substantive interests include political legitimacy, the US Congress, the federal bureaucracy, American political development, and democratic theory. Professor Patty regularly teaches both undergraduate and graduate courses on game theory, computational modeling, formal models of political institutions, political resistance and legitimacy, the US Congress, and the federal bureaucracy. His work has been published in American Journal of Political Science, American Political Science Review, Annual Review of Political Science, Economics & Politics, Electoral Studies, Games & Economic Behavior, Journal of Law and Courts, Journal of Politics, Journal of Public Policy, Journal of Theoretical Politics, Mathematical & Computer Modelling, Politics, Philosophy, & Economics, Political Science Research and Methods, PS: Political Science & Politics, Public Choice, Quarterly Journal of Political Science, Social Choice & Welfare, and The Good Society. 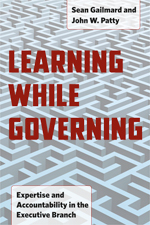 He also coauthored Learning While Governing (University of Chicago Press, 2012) with Sean Gailmard, which won the 2013 William H. Riker book award and the 2017 Herbert A. Simon book award, and Social Choice and Legitimacy: The Possibilities of Impossibility (Cambridge University Press, 2014) with Elizabeth Maggie Penn. He currently ser ves on the editorial boards of American Politics Research, Games, Journal of Politics, Political Analysis, and Political Science Research and Methods. He can be contacted via email at jwpatty@gmail.com. You can make an appointment to meet with Professor Patty here.